How many times a day do you think about death? Frequently. I write a lot about death and unfortunately my brother and father are quite ill.
No. We all get what we make of this adventure. Sometimes I am disappointed that my books do not sell as many copies as other books that are marketed better, but we are all in this together. I get misty when I am watching a movie and the character is selfless or does what they must despite the circumstances. When pressed to watch a chick flick, I will find myself getting a little teary when you have the emotional pay-off of the characters getting together despite the odds. On a lighter note: stupidity, jokes that are so funny I end up crying, general ignorance. Funny movies, pithy dialogue, the human condition in general. The tree had been standing for centuries. Many thought that it had survived the wars that had scarred the earth and shaped the future. Every day in his sad excuse for a life, he walked to that tree as the sun set upon the city. It was an odd sort of place. Amidst a world bathed completely in lights and steel, this one remnant of nature remained unscathed as a pillar that refused to be expunged from living memory. If pressed, many citizens would argue that they had never seen a day that was filled with sunshine. Instead, the world seemed trapped in a state of perpetual sunsets and eternal nights. He stood and looked at the tree, a gentle, cool breeze dancing across the majestic limbs and needles that delicately joined in rhythm with the winds. The monolith of nature was veiled in the fading light, crawling fingers of darkness placing its hold upon the day. Had there ever been a time filled completely with sunshine? The air was smooth and almost sterile. Already the lights of the city jumped to life, a slithering electricity that touched, in order, each billboard and iridescent sign. The tree stood on the farthest edge of the city, closest to the Great Desert that separated what remained of humanity and the barren wasteland that swallowed souls. A steel wall was erected behind that essence of nature, runner lights crawling up the heavy border. Beyond the wall was nothingness. A vast ocean of sand that served as little more than a reminder of time passed and horrors witnessed. Whipping his long coat around him, it cast shadows of distant denizens and haunting beasts that were little more than colorful fiction. It was quiet this night, as it was quiet most nights. Fewer and fewer people came to visit this place anymore. Such a reminder was an open sore from a history that many would love to see forgotten. Shadows emerged. Men and women rose from their slumber and moved about the city, the curtain of night a catalyst for their activities. He watched them out of the corner of his eye. The world had become an immensely safe place. There was no war. Poverty had been abolished, laws and rituals instituted that would maintain the pleasant temperament of the newly formed society. The cerulean aura was sudden. The ring flattened around his temples and then across his face, covering his features like a theater mask. Images flooded in front of his blue eyes. Advertisements flashed faster than his eyes and brain could process. He grinned, a small turn of his lips. His azure eyes scanned ahead, his mind pushing past the advertisement as well as a plethora more that were ready to assault his mind. Already he missed the simple serenity of the tree, its stoic power and magnanimous nature a welcome change to the self-serving society that had taken shape in the last centuries. “News,” he rasped, the images responding. He walked forward, red lines running the edges of his vision as he walked near another citizen. Not a word was exchanged as they passed into and out of their respective existences. The images moved faster and faster, blurs of people melded together until it stopped. A dark background labeled in metallic lettering spoke simply of the broadcast’s nature: the news. The image shifted to Praetor Buchanan, his heavy face seemed to shine as if it had been oiled. The deep sockets of his brown eyes seemed to hide an intelligence that his easy manner belied. Despite the heavy jowls of his face, thick robes hugged his gaunt frame. Dr. Aaron Roth, headmaster of the Cerulean Dreams Empire, controlled a vast network of electrical and neural impulses that successfully managed the day-to-day lives of the citizens of Orion. He was a sweepingly powerful man, perhaps more so than Praetor Buchanan or any other single being in Orion. The face of Hadrian Shamus returned. The screen blackened for only a moment before the subtle chimes and rustling sounds of leaves overwhelmed his senses. Darkened letters penciled themselves across his vision: Report. Respond. Rely on OrionCorps for the everyday safety of you and your family. The words flashed several times. The soothing sounds of ocean winds announced the exit of the propaganda, only to be replaced by another and then yet another. Each was as uneventful as the last. Orion News in bold letters crawled across the screen and the overly joyous face of Shamus returned, his plastic smile held firmly in place. The screen focused in on an elderly woman. Her thick pink glasses hung comically around her eyes, the lenses darkened profusely and thick gold earrings hung from her stretched ears. “I think that it is aliens, coming from some other galaxy to take us away,” she spoke in a riotous overtone. The signal cut back to the laughing face of Shamus and then on to another man, a child, a woman, each of their answers inconsequential and no closer to what may be truth. It mattered little to him. “Come on,” he mumbled angrily. “Disengage software,” he grumbled in dissatisfaction. The visor halted further imagery, but a thin red line remained as well as a yellow dot that flashed in the left of his vision. The voice was decidedly feminine. “Do you wish to log off the network?” she asked mechanically. “Negative. Signal active, imaging dormant,” he responded without emotion. The visor rose and wrapped back to the left temple of his skull. A small blue, pulsing sphere remained, waiting. The city was a monstrosity, plain and simple. Buildings rose into the heavens, beyond all sight during the night. False lights guided to empty places and colorful signs depicted diversions and empty consumptions to pass the times. Vehicles flashed overhead, alongside the buildings. Their trails crossed high into the atmosphere, some even beyond the line of buildings. Orion was a metropolis built upon a metropolis. Many of the markers of old had all but disappeared. There was simply Orion and the desert, the bustling city and the simple death. The streets were littered with people, their visors donned, vision and minds enraptured by Cerulean Dreams programming. They chatted with friends, their mouths moving. Words that could only be conversation flowed from their lips, even though they spoke to no one. Words echoed all around him. Without the visor, he was painfully aware what a horrendous symphony their collective voices created. He watched the billboards and signs. 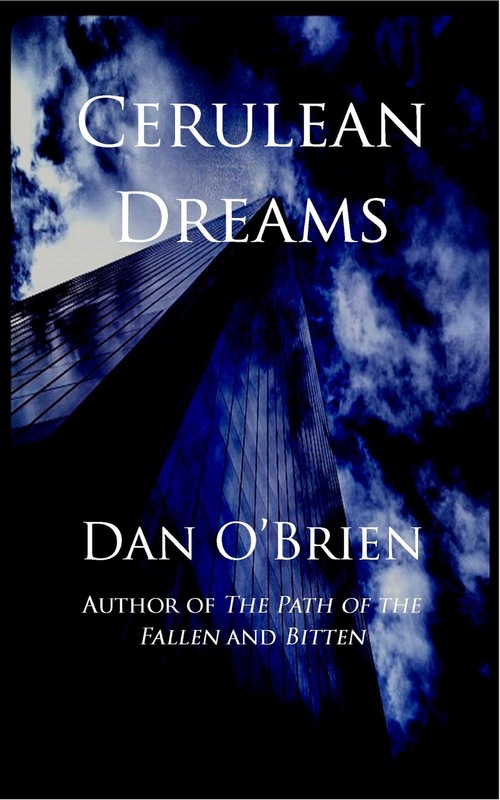 Cerulean Dreams owned a piece of everything: entertainment, production, and government. Without their constant supervision, Orion would not be able to function as it did. Programming dictated their movement; every task was completed for them via the Cerulean Dreams software and a massive network that stretched from city wall to city wall. An air cab rushed past, the orange lights of its descent casting a strange shadow across his features. His strong jaw and blue eyes watched the cab pass within a meter of him, yet he did not waver. It would have been inefficient to do so, since proximity warnings and various other technologies made it nearly impossible for an air vehicle to ever collide with a human. 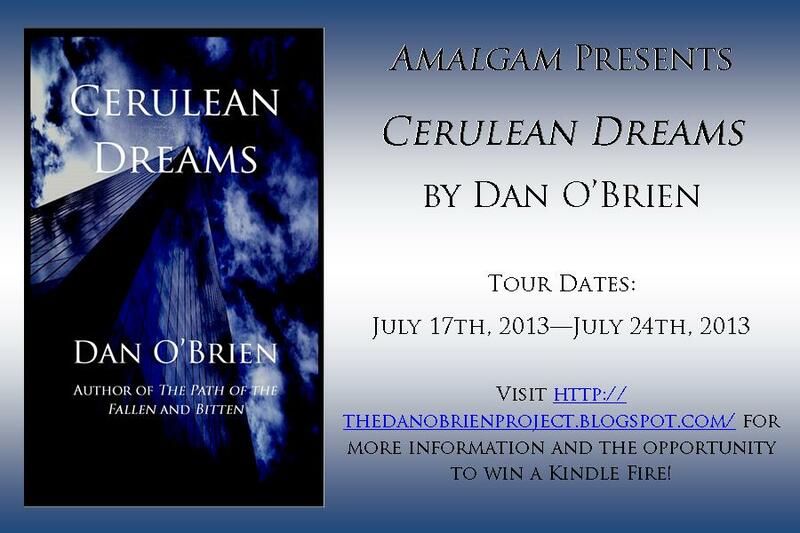 Cerulean Dreams had made sure everything worked as it should. The street narrowed into several smaller streets, albeit unnamed without the imaging visor. Within it he could have seen the virtual map of the city and walk through it, every street named, every pothole, bend in the road recorded. There was little individuality left in simply following what others had laid down. He wished to do it by memory, by feel. The runner boards overhead spoke of what was on everyone’s mind: the upgrade. One could not go anywhere in Orion and not see an advertisement for the upgrade, for up-to-date software was vital to link with the parent network at Cerulean Dreams, which sat at the very center of Orion. Turning sharply to the left, he chose the darkest of the split pathways. Obscured by the darkness, puddles had collected along the sides of the street, an oddity given the limited possibility for rain in the middle of a desert. He made sure to dodge them carefully. The long wings of his coat drug as he marched. In a city whose morality and peace was regulated by a third-party, there was still a district where you would not want your grandmother to walk. Not for fear of death, but for those activities that might be deemed otherwise unsavory. The poor, the destitute: that was where he had guided himself. Ducking into a dark door, the dull chime announced it as the dive it was. He seemed at home. “Marlowe,” called a heavy voice across the tavern. A few sparse bodies were ducked into booths, visors down––stained glasses inhabited the darkened interior. The wide expanse of the bar was unoccupied, the necessity for a bartender seemingly forgotten. Marlowe looked farther into the bar, seeing the root of the voice. Heavy in every part except his wallet, a man sat uneasily at the bar. His face ran with sweat and the heavy coat around his shoulders seemed three sizes too small. He drained the glass in his left hand and then made as if he was going to stand. Marlowe waved him down and took the iron stool next to him. Jackson waited for an answer, but received nothing as a dirty glass rose from deeper in the bar. Marlowe grabbed it gently, taking a sip and clicking his tongue reassuringly. “You weren’t at that ridiculous tree again, were you?” asked Jackson. Marlowe stared ahead, the blue sphere along his temple throbbing angrily; information waiting in the wings that he so deftly ignored. “Last living thing, worth taking a look at from time to time,” he spoke, his voice gravelly. He took another sip, sucking his lip and clicking his tongue once again. Marlowe turned to Jackson, drink in hand. “All that power and can’t help a poor woman, huh? Some saviors,” he replied. Placing his drink back on the bar, the ice swam in a small puddle of brown liquid. Jackson hesitated, looking around the bar at the other patrons. There was a sudden paranoia in his eyes, as if the words that were about to come out of his mouth would draw lightning. Marlowe looked at him, his gaze hard. “Doesn’t seem to be anyone’s job in a utopia. No one is looking for them. What trouble can I get in when no one seems to care? You got a name?” asked Marlowe, swishing the ice and alcohol-ridden water into a small swell in the stained glass. “Regardless man, you follow these long enough you are bound to find something. I doubt it will be something that will be a positive life experience,” warned Jackson, his wide brown eyes glazed, pleasantly swimming. The archaic chime croaked again, but Marlowe had already filtered into the night, the buzz of electricity permeated the air. This and the distant, unfocused voices of the citizens of Orion talking to themselves made Marlowe feel quite alone.